Many thanks to Aoife and Drew for the great work they did on Act 3 quotes. It is much appreciated. So it is time now to start commenting on one quote from each of the three acts detailed today. I will extend the deadline to Saturday 8pm. Choose a quote, write it in the comment box and outline the impact it has had on you. As always give some background details and significance too. Great work done by Saula and Gabriele. Thank you for putting the Act 2 quotes together. Again 5th years, now you must read the quotes and choose one or part of one that has made an impact on you. rewrite the quote in the comment section, give details of the context and significance and add your own thoughts, opinion, reflections. Act 3 should be up before the end of the day. Here are the some important quotes from Act 1. Many thanks to Simon and Lydia for their hard work putting these quotes together. Now each student has a task. You must choose one of these quotes, or a portion of one and write the quote into the comments section below, comment on the context – speaker, when, why and to whom s/he speaks and significance of the quote. Please also make sure to add your own personal response to the quote. (Apologies, but it might take me a little longer than planned to compile Acts 2 and 3 from the students who submitted on those acts – but hopefully before the end of the day.) Just click on the link below to access the quotes. Good luck! 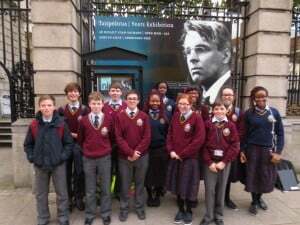 Students from Franciscan College, Gormanston attended the National Library of Ireland today for the regional heats of the Poetry Aloud competition. The students had to recite two poems each for a panel of judges – one prescribed for them and the other was of their own choosing. 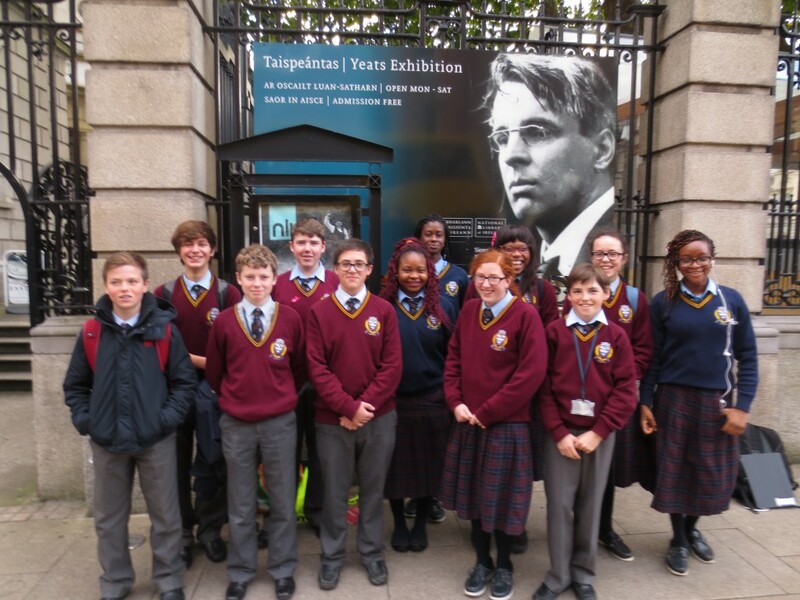 Students in the Junior Category had to recite the poem ‘Heirloom’ by Gerard Smyth. In this category we had Sarah Browne and Evan Logue from 1st year and Maya Keeley, Raven Opashi and Todd Lynch from 2nd year. Students in the Intermediate Category had to recite ‘An Irish Airman Foresees his Death’ by W.B. Yeats. We were represented in this category by Alex Konchar, Kyle Keeley, Chris Leech and Adam Lally. Students in the Senior Category had to recite ‘St. Kevin and the Blackbird’ by Seamus Heaney. In this category we were represented by Veronica Filani, Miriam Mputu-Ntela and Nadia West. Congratulations to all who took part. You did yourselves and your college proud! 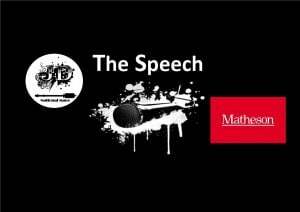 “The Speech” was a massive success last year and was reported on both locally and nationally. This year we want to make it bigger and better! This year we are inviting secondary school students (First to Sixth Years) to submit a video of them delivering their favourite speech– historic, cinematic, from literature – and post it on YouTube and send the link to the organisers. A judging panel of film and oratorical experts will adjudicate the top videos (as decided by Likes on our Facebook page). 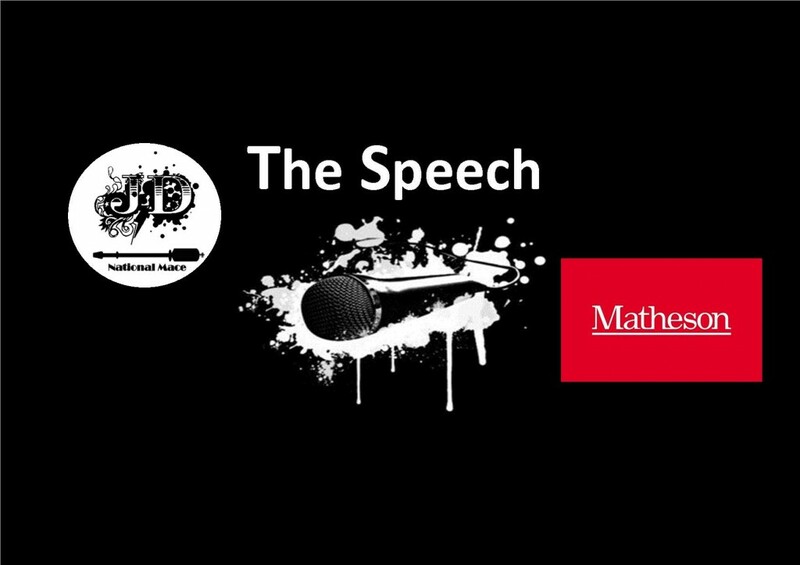 The winner will receive an incredible state of the art netbook and Matheson “The Speech” Trophy, to be presented to the winner at the Junior Debating National Mace Final. 1. At the start of your speech you should explain why you choose it and why it is an important speech. 2. The Finalists will be judged on the following criteria. The significance of the speech and the reasons given for choosing it. Their delivery of the speech- did you make it your own? Did you engage your audience? Production and presentation of the speech. Secondary school students – From first to sixth year. There will be a Junior and a Senior Category. Create a video – up to ten minutes in length – of a famous speech. You can use whatever tools you have at your disposal – props, editing software, sound techniques etc. Upload the video to YouTube including “The Speech” in the title and “Junior Debating National Mace” in the tags. Once the video is ‘live’ on YouTube, send the link to the organisers so we can put them all up on the facebook page on the same day. You should include your name, school and year. More Importantly – How to Win! The top videos chosen from ‘likes’ and the panel’s choice will be shortlisted. These videos will then be judged by film and oratorical experts who will choose the overall winner of a State of the Art NETBOOK!! There will be a Junior, Senior and overall Winner- all receiving amazing prizes and trophies. The deadline extends all the way to Friday the 30th of January and all videos will be put up on “The Speech” Facebook page on the same day Sunday the 1st of February. Then you need to get your friends and family to start liking! Voting closes on Thursday the 12th of February with the shortlist on Friday the 13th of February. Then you have until Friday the 27th of February to re-shoot. Like all the Junior Debating National Mace Competitions photos will be taken of the finalists and their videos will be available on both social and national media. Photographs and videos will be distributed to local and national media. Photographs and videos will be used for the promotion of the competition on our website, facebook page and by our sponsors Matheson Solicitors. Press releases will be issued and journalists will be invited to attend the grand final. Speeches may be recorded and all finals will be recorded and these will be used for promotion of the competition in the media, the website and social networking sites eg youtube, facebook. Please note that it is the responsibility of each school to secure permission from parents for student’s participation in all of the above. Where parental permission has not been granted it is the responsibility of the teacher/school (and not the Junior Debating National Mace) to ensure that student does not take part in the above. The Junior Debating National Mace accepts no liability in respect of any claims which may result from the participation of children for whom consent has not been obtained from their respective parents. Best of luck to all the Gormo students are thinking of entering. Here is a link to the finalists of last year’s competition. For more information see Ms Meighan, Ms Ryan or your English teacher. Keep reading, enjoy words, make connections, figure out meanings through context, make language your priority. 1. ____ by nature, Jones spoke very little even to his own family members. 2. Biological clocks are of such ____ adaptive value to living organisms, that we would expect most organisms to ____ them. 3. The peasants were the least ____ of all people, bound by tradition and ____ by superstitions. Let’s have another challenge from the vocabulary vault. This time it’s back to word roots. See how many words you can form from the root ‘voc’. In the comments below do three things – write the meaning of the root, say what language it originates from and then list all the words you can find with this root. You will have to be able to explain the meaning of every word you write. As always, please complete the task before noon on Sunday. Enjoy! Remember: ‘VOC’. Choose your scene. The ones in bold are particularly dramatic. Start preparing now! Get props and suitable costumes if you can. Work on tone of voice, movement, sound effects. Practice, practice, practice!! Have fun and be experts. Invite your parents to attend if they wish! There will be prizes galore! Seven days of Easter made Ireland. We lost friends; we won wars. I wish I could run faster! Run and save your good life! History – a thing of the past. Once a soldier; now a fighter. And then he pulled the trigger . . .
Mam! Dad! Will I make it? False start: too fast to win. No more trees; no more money. Relationship status changed: ‘married’ to ‘divorced’. Sold your soul for the fame.